of love to our paper crafting projects. Keeping that in mind, what would be more fitting than to start off February with a Valentine Challenge? ♥ To enter the challenge, create a layout, a card or an altered project with the theme Valentine in mind, using some of your favorite Pion Design papers. ♥ Share a direct link to your creation/s, not just your blog, using the InLinkz feature at the end of this post. Use one InLinkz for cards, one for layouts and one for altered projects. Please, no back linking. ♥ The challenge starts today, ends at February 12 and is open to all paper crafters worldwide! ♥ The winners in each category will be announced on Thursday, February 14, and they get to choose a complete paper collection from Pion Design. 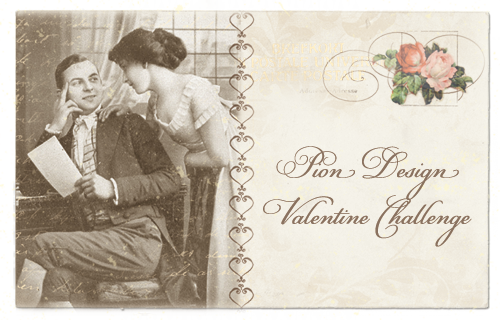 So welcome to join the challenge and start spreading some love with Pion Design!